Do you Play Cafeland? Join GameHunters.Club our members share free bonus, tips, guides & valid cheats or tricks if found working. Check out the Cafeland Bonus page to see the full list. If you need to add friends for gifting or exchanging game-items you can check or join the Cafeland Add Me List. GameHunters.Club is a Fan Site and is not endorsed by or affiliated with Cafeland. All Trademarks are the property of respective owners. If you love this game, support it by purchasing premium items in the game or follow the official Cafeland social media channels. Join the Forum, Discuss anything about Cafeland. You can talk about tips, tricks, cheats, ask for help or simply introduce yourself to the club. These are the most recent topics and posts on Cafeland Forum. Do you know any of this topics? Help players by posting about this topics on Cafeland Game Post section. Come here, lonely chefs! It's Friday, we are in love with this game and need neighbors! Don't be shy, come to say hi! Aye, aye chef! Land Ho! Let's get ready for a treasure hunt! >>> https://bit.ly/1QkMouF... PS: We have been reported that many of you have troubling with sending requests. Unfortunately, this issue is not on our side and we have to wait for Facebook developer team to solve the problem. We have created a bug report for them and also our team is investigating this situation. We have found that "send all" button may be problematic, so we suggest you send your requests without using this button until this issue resolve. *Please make sure that your browser and Flash Player is up-to-date and try sending/requesting on different browsers because this issue also might be related to your browser. * Thanks for your great patience. Hi everyone! We, as Gamegos, need players who'd like to experience the new levels of our brand new puzzle-simulation game Manor Cafe before they are released! You will get to keep your normal game, and you'll also have a new test APK which features the new levels! You need to have an Android smart phone or tablet, and free time to play the levels every week. If this sounds interesting, please send an e-mail to [email protected] with the title I want to be a tester including your device details, your current active e-mail address and the link to your Facebook profile (our team is going to add you on Facebook later)! Hello everyone! If you are not seeing anybody on your neighbors or friends list, please follow the instructions below: - Go to your settings on Facebook... - Click on Apps - Find Cafeland and click on Edit Settings - Check to see if you have your "Friend List" has a checkmark next to it on the popup - If there isn't a Friend List permission, please remove the app and open it again. Your progress is saved on our servers, you will not lose anything. Enjoy the game and have a nice day! 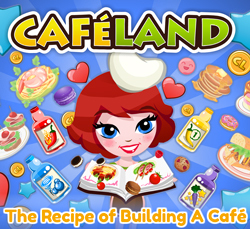 Build your own cafe, diner or restaurant! Be the best chef in the kitchen & keep customers happy by cooking delicious dishes!